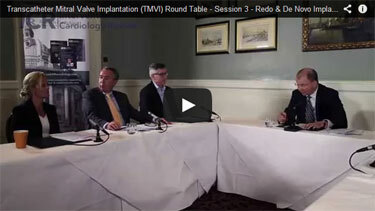 On the 29th September 2014, Radcliffe Cardiology filmed an expert roundtable discussion, comprised of 3 sessions, focused on the emerging field of Transcatheter Mitral Valve Implantation (TMVI). The third and final session focuses on the exciting, emerging field of transcatheter mitral valve interventions. The expert panel discuss both Redo & De Novo implantation, available and emerging technologies, procedural limitations, success rates, complications and patient selection. Discussants for this session include: Simon Kennon (Chair), Georg Lutter, Neil E Moat, Darren Mylotte, Lars Søndergaard & Nina Wunderlich. 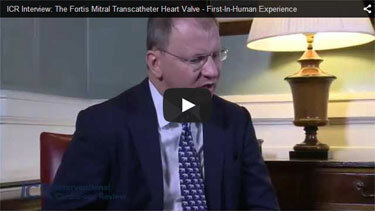 As an adjunct the TMVI roundtable, ICR Editor-in-Chief Simon Kennon interviewed Mr. Vinayak Bapat (Guys and St. Thomas's Hospital, London, UK) on his unique first-in-human experience with the Fortis Mitral Transcatheter Heart Valve. We hope that you enjoy the footage and find it useful for your clinical development. To advertise here, please contact Michael Schmool on +44 (0) 203 575 1397. RadcliffeCardiology.com aims to support life-long learning for cardiovascular professionals. Providing a platform for peer-reviewed content from industry-leading journals Interventional Cardiology Review, European Cardiology Review and Arrhythmia & Electrophysiology Review - alongside other carefully selected sources - RadcliffeCardiology.com endeavours to support clinicians and leading industry professionals in continuously developing their knowledge, effectiveness and productivity. Radcliffe Cardiology's registered office is at Medical Media Communications Ltd, trading as Radcliffe Cardiology, The Clock House, Station Approach, Marlow, Bucks, SL7 1NT United Kingdom number 8772497 and VAT number GB175316309. © 2014 Radcliffe Cardiology.